How to get around the Cinque Terre. You can travel by train, foot, ferry and car between the villages of the Cinque Terre. But, try to leave your car behind. How to get around Cinque Terre: The fastest way is by train. Each of the five villages has a small train station. Riding these trains between towns is the easiest and most efficient way of getting from town to town. Each train station has a ticket station, but these ticket stations close at 7 p.m., so if you’re going to need a train ticket back to your hotel or apartment after 7, consider buying them ahead of time during the day. A single ride ticket is between 4 euros from April 1st to November 1st and it’s called Cinque Terre Express ticket. The towns are very close together; riding the train from Riomaggiore to Monterosso, making all local stops at each of the Cinque Terre Village, takes about 15 minutes. Some trains *(very a few) might skip one or two villages since they run express from one end (Riomaggiore) to the other (Monterosso) end of the Cinque Terre or viceversa, which is about a 5 minute ride. Please, carefully read the itinerary of the train you are about to step on, otherwise your trip to your final destination might become a real nightmare of missed villages and useless stops and changes. And you’ll be late for your check-in time, too! 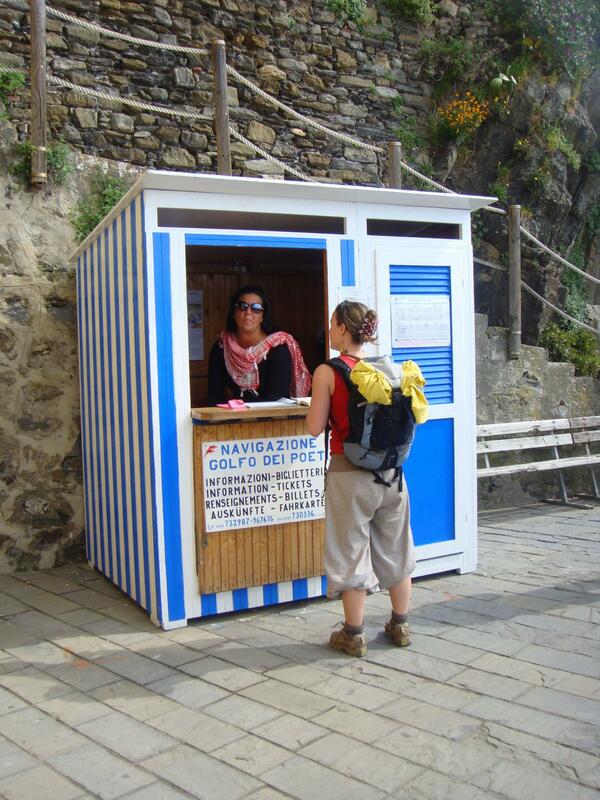 How to get around Cinque Terre: The slowest and cheapest and surreal way is on foot. Trails connect each of the five villages of the Cinque Terre, which is a national park. Tons of tourists from all over the world come to hike the trails connecting the five villages. You see a lot of people with walking sticks, bottles of water and walking sticks. You do not need to bring walking sticks from home, Giovanni and Jenny at Vernazza Sport Store in Vernazza rent them! And they sell all you might need for your hiking tours, from maps to water bottles to professional and leisure equipment. Their selection of Italian hiking shoes is just amazing. More on hiking trails and The Cinque Terre Card or hiking pass. 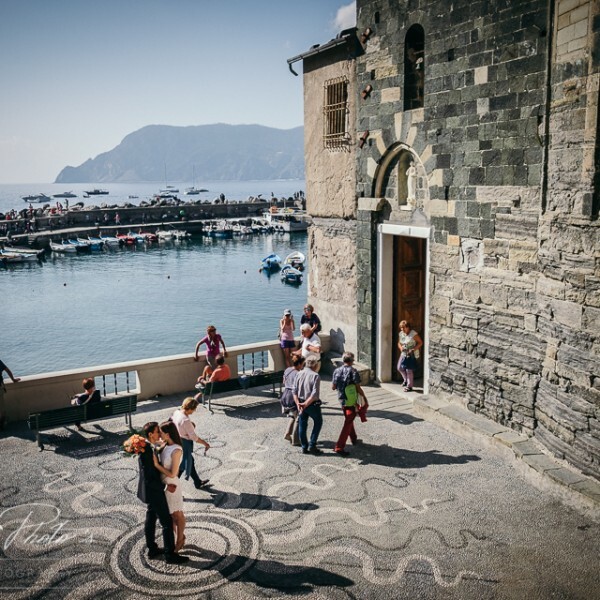 How to get around Cinque Terre: The slow but most scenographic way is by boat. There are ferry boats running between the villages except for Corniglia. It’s actually the best way to see the landscape, although it’s not the fastest or the cheapest. If you want to spend a day village hopping, it makes sense to get a daily ferry pass. Each leg of the ride between the villages is about 10-15 minutes. If you don’t have a full day to dedicate to seeing all five villages, you still can use the ferry as a way to get to your first stop or as a way to get back home. If you decide to travel between the villages by boat, you should consider also visiting PortoVenere, which is a picturesque village that you can visit just by boat. If you still have any questions on how to get around the Cinque Terre, please send us your questions!